It was one of those glorious spring skiing weekends with soft corn, blazing sunshine and good ski buddies to share it with. 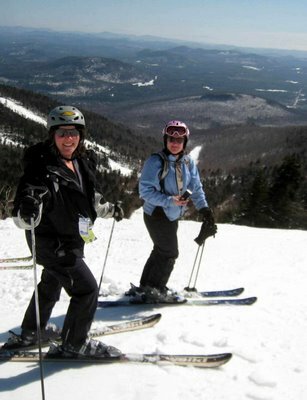 Saturday we’d skied at Greek Peak in perfect spring conditions with a posse of good friends. 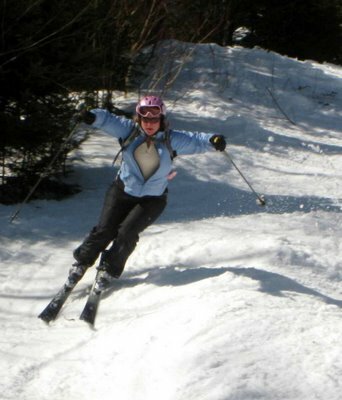 There is no snow anywhere outside of the ski area here in central NY, so no one believed that there would be any decent snow to ski on. Everyone thought it would be marginal, and for those who made the effort to ski expectations were surpassed. Five of us skied from noon until 5pm. Tailgated lunch and apres in the parking lot. We would have done the Chair 5 “beach” scene, only the mud was thick and deep, so we stuck to the terra firma of the main parking area. Sunday, Pam, Marilyn and I got an “alpine start”, leaving our homes before sunrise. Beating the church traffic, we had an easy drive and arrived at Gore at 10:50. We were on the gondola by 11:30. The temps were just getting above 40 as we arrived. The woods were still quite firm, though my crazy local friends had already done a lap all the way to the Ski Bowl and found some softer corn in the woods at lower elevations. The glades in the higher reaches were still very stiff and solid, glazed shiny in some places, so we stuck to the trails, which kept us plenty entertained. Everything was soft and skied well. The highlights were Lies, Rumor, Top Ridge and Double Barrel. We warmed up with runs on Chatiemac and Hawkeye…both softening nicely. On our 3rd Straightbrook lift ride the ski patrol was skiing the then closed Double Barrel. It looked glazed, but the glaze was softening in the sun and skied like butter on toast. The toast being the crusty base of ice and rock beneath the butter. They decided to open it and we got on it early and were able to schmear some untouched butter on the toast. It skied quite well. I had a great run and tried to exit high, only I didn’t have enough speed to make the lip, so that plan failed. I then had to take the lower exit and got flung from the top of the dip, making for an ugly exit, for all to see from the lift. 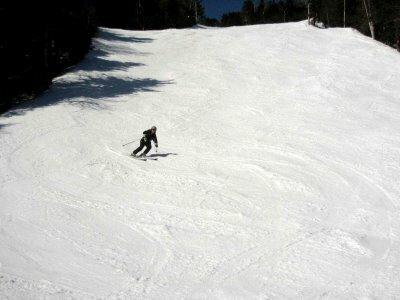 Oh well, at least I displayed some nice satisfying turns prior to that grand finale. For me, that was the run of the day. We continued across Hawkeye on the bumps under the lift. They skied so well. The heat was building and it was time for a short break. So we rode the quad to the summit and joined some of our local pals for a break at the picnic tables near the warming hut. Chomped down a pb & j, hydrated and put my fleece sweater in my pack. I was ready for my first run on Rumor of the season. The headwall was a bit sketchy, but once below the exposed rocks it was sweet. There were a lot of people on it because besides Double Barrel, it was the only challenging trail with bumps. Both bump runs got a lot of traffic. 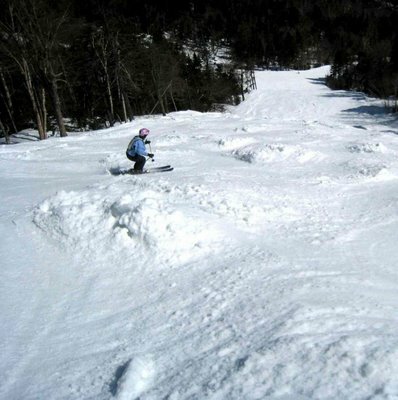 Lies skied the best and didn’t really have bumps but got large soft mounds by the end of the day. The corn was especially sweet over there. We did a lap on Hullabaloo for a change of scenery. The north side was icy and glazed. After another break to raid our cooler that was stashed on the deck, we went up to see how Topridge was holding out. It was sweetly soft and corny. It was one of the best runs of the afternoon, but we only got on it once. We went back to Rumor at 3pm only to find it firming up. It was getting crispy and was more challenging at that late hour than anything we had skied all day. The snow was skied off between the bumps and was no longer soft. We did one last run on Lies and were herded past the closed Straightbrook lift at 3:30 down Tannery to Topridge. We had hoped to get one last run on Topridge before it was all over, but the rope was up. 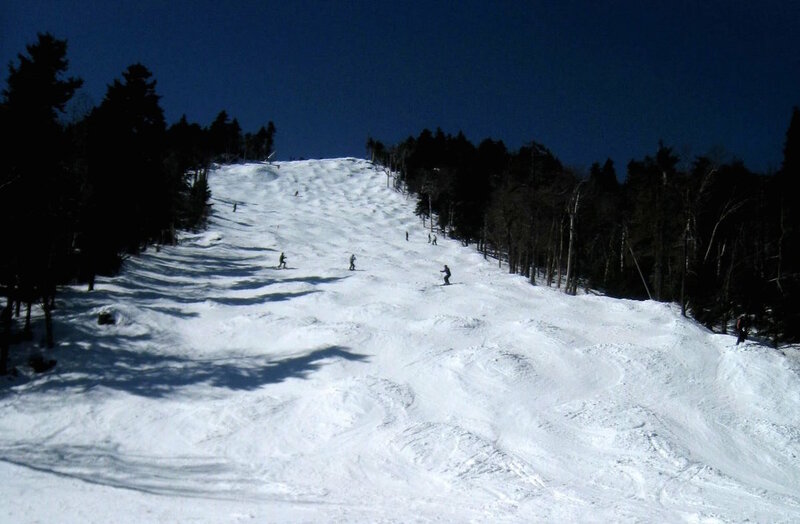 We skied down Fox Lair to Wild Air…both were super soft and fun. The gondola had already stopped loading and we were done. We did a little deck time in the sun. We were baking in the warm sunshine. Socialized with some friends, drinking the last of our beer. With a short detour and a quick stop for dinner, we were home by 10, sunburned, aching and smiling. A long day trip, but well worth the effort. Thanks for the report PDQ. Glad you had such a great day. Nothing beats great corn on Rumor. That really makes me miss the mountain, nice report.